Supplementation is important for pairs grazing cornstalk residue. Photo credit Troy Walz. However, when grazing cornstalk residue, fall calving pairs present two challenges their dry, pregnant counterparts do not. The first consideration is that lactation can more than double the energy requirement needed just to maintain the cow’s body condition. The second consideration is that the calf will consume at least 1% of his body weight in forage by 3 months of age. Forage intake is important for rumen development, but also for nutrient consumption for growth even beyond what milk is providing. 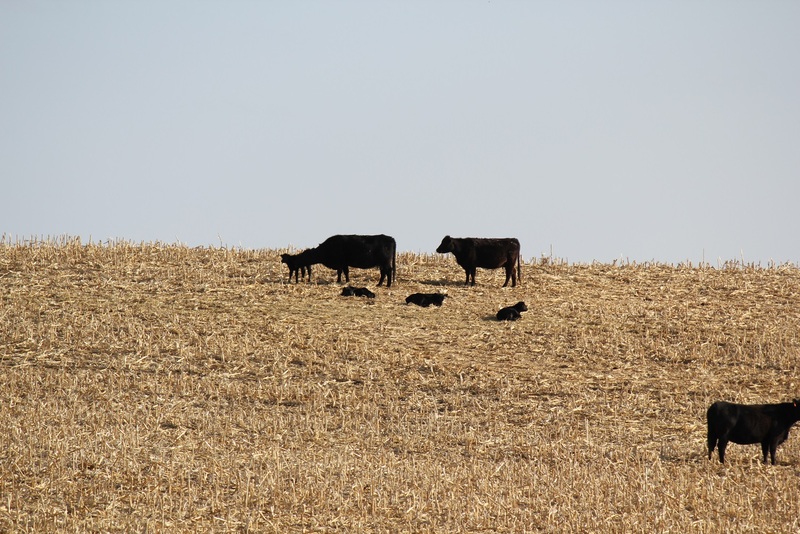 A study (Effect of Production System on Cow and Calf Performance) conducted by the University of Nebraska compared the performance of cow/calf pairs grazing cornstalk residue with pairs maintained in confinement. Pairs grazing cornstalks were supplemented on average 5.5 pounds per day of a dried distillers based cube that also contained calcium, trace minerals, and Vitamins A, D, and E.
The results of that three-year study indicated nursing cows grazing cornstalks from November to April, lost about 0.5 body condition score even though they received supplement. However, the subsequent pregnancy rates of those cows were not different from cows maintained in a drylot. It is also important to note that the average body condition score was 5-6 (1-9 scale) which is moderate. In a fall calving system, cows would have time to pick up body condition after cornstalk grazing ended in April and prior to calving, which is likely August or September, if necessary. The nursing calves grazing cornstalks from November to April gained approximately 1.5 pounds per day, while the nursing calves in confinement gained approximately 2.0 pounds per day. However, a partial budget analysis revealed that due to the reduced cost of cornstalk rental relative to the cost of maintaining the cattle in confinement, the lighter calves produced a greater net profit than the confined calves. When utilizing cornstalk residue for fall calving pairs, it is important to remember that lactating cows require about double the energy that dry pregnant cows do, and that growing calves need supplemental feed to develop the rumen and help digest low quality feed such as cornstalk residue. Therefore, supplementation is important for pairs grazing cornstalk residue. The economics of the complete system should always be evaluated because net profit may be greater even when performance is less than another comparable system.